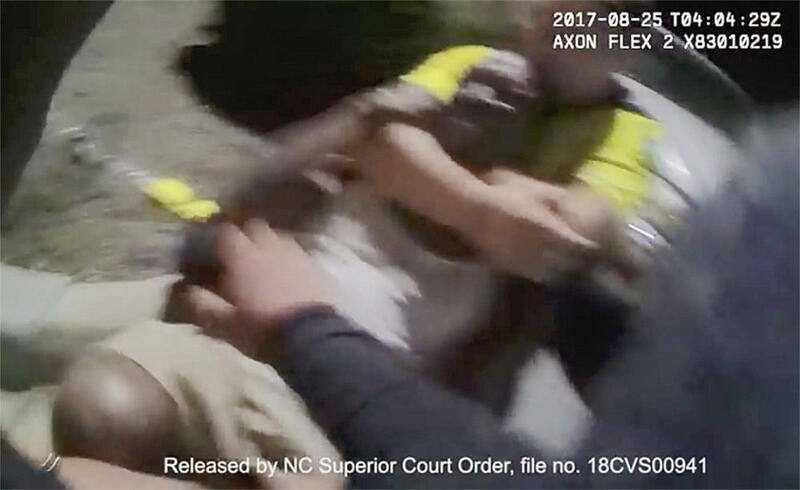 In this Aug. 25, 2017 image made from video and released by the Asheville, (N.C.) Police Department, Johnnie Jermaine Rush grimaces after officer Christopher Hickman overpowers Rush in a chokehold, in Asheville, N.C. Earlier this year, a shorter clip obtained by a newspaper sparked anger in the community and helped lead to a felony charge of assault by strangulation against former officer Christopher Hickman. City officials in Asheville, North Carolina, released nine body camera videos Monday of the August 2017 encounter — most of it made public for the first time. Earlier this year, a shorter clip obtained by a newspaper sparked anger in the community and helped lead to assault charges against former officer Christopher Hickman. After being punched, choked and shocked with a stun gun, pedestrian Johnnie Jermaine Rush incredulously asks Hickman's supervisor why she appears to find the officer's account more believable than his explanation of what happened. "You weren't even here to know what happened," Rush is heard saying to Sgt. Lisa Taube. "You're just going by what your officer told you. There are two sides to every story." Taube then responds: "There are. And, thankfully, I've got body-worn video camera to watch afterward." Taube, who arrived on the scene after the altercation, was disciplined for her handling of the case, police have said. A judge ruled a week ago that the new videos from multiple officers could be made public. North Carolina law generally prevents the release of body camera footage without court approval. In the new clips, Hickman acknowledges several times to Rush and to his supervisor that he struck the pedestrian. When Taube asks if the Taser was effective, Hickman said: "I hit him in the face with it. I hit him in the face as if it was a club. That was effective." The footage stretches into a 20-minute clip of conversation after Rush is released from the hospital and is heading to jail, and the two men have an almost oddly calm conversation. Another of the new clips from an officer arriving as backup appears to show Hickman using both arms to restrain Rush by his neck. Police have previously said Hickman put Rush in a chokehold, but it was difficult to see that on Hickman's own body-worn camera that was leaked to the newspaper. Hickman, 31, was arrested in March on a felony charge of assault by strangulation, plus misdemeanor counts of assault and communicating threats. Hickman is shown on the videos subduing Rush, then punching and shocking him with a stun gun. Rush was stopped because officers accused him of crossing outside a crosswalk near a minor league ballpark and a cluster of breweries popular with tourists. While the encounter happened late last year, it took six months for it to become public through the leak to The Citizen-Times. The first video leaked is from Hickman's body camera, and footage released Monday shows different angles. Community outrage spilled over with angry comments at a March community meeting with the police chief, and even the City Council expressed anger it wasn't informed of the case for months. The former officer's lawyer, Thomas Amburgey, released a statement Monday that Hickman showed no criminal intent to harm Rush. "It's unfortunate that so many individuals have rushed to judge my client. I am confident that when a fair and impartial jury hears the whole story that Mr. Hickman will be acquitted," Amburgey said in the statement. An arrest warrant for Hickman said Rush suffered head abrasions and swelling and lost consciousness when Hickman pressed his arm on his throat. In the clip at the hospital, the two laugh and calmly discuss what happened while standing outside the hospital. Hickman called Rush "super cool" as he prepares to take him to jail. "Once we get there, is there any way y'all can have them to let me go to the restroom so I can clean myself up?" Rush asks. "Absolutely," Hickman answered. "Soon as they get those cuffs off, that will be the first thing we do."